The ramblings of Tyson as he sups his way through life's bitter vale of tears. The Kimberley Workingmen’s Club in Stacksteads, Rossendale is the stuff of legend. Few, outside of those interested in such things, have heard of it and fewer still have visited it. Even many locals aren’t aware of its location and yet internet forums are full of people willing to travel across the country to visit a genuine slice of social history. Established in 1897, the KMC started out as an afterhours drinking venue for quarry workers. Legend has it that it was carried down into the valley on poles. There are various theories about its South African connections-there is a Kimberley Street close by, but what we do know is that surprisingly little has changed since those early days. Once you have got up the steep hill, over the dirt track and through the gate; you are confronted with two very small rooms. There’s probably just enough room to squeeze all 36 members in. This helps to explain why visitation is strictly by invitation only. We were privileged to enjoy a special Sunday opening. Normal hours are Tues. Thurs and Fri after 9.30pm. When you are sat in the inner sanctum with the locals (and their dogs), you really are transported back in time. In fact, time becomes meaningless as you sup under the light of the single gas light. Naturally there’s no electricity-the vacuum cleaner is oil powered and the only nod to food is a packet of nuts. They can’t keep crisps, they’d get too damp. However, some modern elements are present. They received planning permission to build toilets in 1934, but actually only got round to building them in 1999. Prior to that, it was "ladies use the short grass and gents use the long grass". They also do now have (a few) bottles of lager for anyone from outside of the valley. Of course, there are no handpumps, so all the beer is brought up from the cellar. Taylor’s Dark Mild and Best Bitter are the choices, and I have to say I was impressed with how well they kept them. £1.50 for the Bitter may have the £5-a-pint craft beer aficionados spluttering into their Bollinger, but I didn’t hear many complaints. A great day out and thanks to the Kimberley and Uncle Albert for arranging it. Do they have all-day opening on 1 April each year? A visit is well worth the effort. Despite being told what it was like its still a bit of an eye opener to spend a couple of hrs with the locals, maybe a dog or two and in rough weather even the odd bike. The beer is very good and the right price. Black Peas & a pie more of an aquired taste. Visited once with a couple of mates from Rochdale late 60's. Reputation then was legendary for after time cf normal pubs which was strict 10.40 p.m. and thrown out. Memory is of very intimate premises. Left around midnight and how we got home I'll never know! I live literally a mile-and-a-half away, yet I have only visited once - last New Years Day.........what a fantastic experience. The ambience was surreal, yet relaxing - vastly better than the usual traditional style pubs with loud pumping music and big screen TV's. After paying my initial temporary membership fee on the cost of my first pint, I could have had a total of six pints for a tenner...........try that in Manchester! The ale was proper ale too.........not this mass-produced, over-priced, chemical-based rubbish! Was it only three years ago that Manchester was gripped by Cloudwater inaugural fever? It seems a lot longer. Ah I remember it well. How innocent we all were. How young we all were. How thirsty we all were. But in the words of that great prophet Robert Zimmerman: "the times they are a-changin'. Indeed they are. Cloudwater-to no one's great surprise-are now firmly established in the top rank of UK craft brewing with a reputation that encompasses Trumpland. But where can you regularly drink this delightful Manchester nectar? Until recently the answer would have been their Barrel Store underneath the Piccadilly arches. 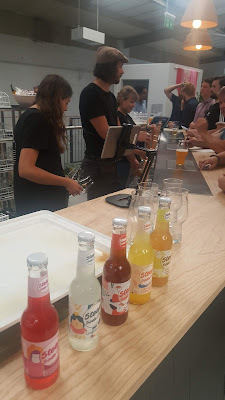 While some may have enthused about its cosiness, truth be told, it wasn't the best showcase for Cloudwater's beers. A brewery with the standing and ambition that they have needed a more suitable outlet. Something, say, like a proper brewery tap. 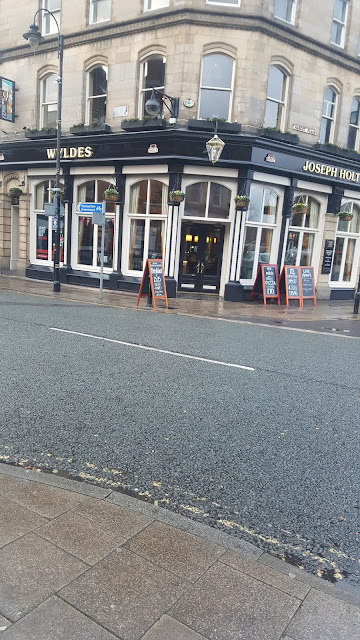 Wyldes sits on the corner of Bolton St and Market Place in the centre of Bury. When it first opened, it was a flagship Holts pub. It sold Mild, Bitter and, revolutionary for the time, guest beers. It offered all day dining and sports TV. However, the wheels soon began to come off. The guest beers were too expensive for the regular Holts drinkers and quality suffered. This in turn deterred the casual drinker from going in and slowly both Mild and the guest beers disappeared from the bar. I wrote about its woes back in 2008 and the years in-between havem't been kind. Pub trade in the centre is fiercely compettitve and it's had more lows than highs. It didn't get to grips with Wetherspoons on the food side, failed to build up a weekday trade and relied too heavily on the weekend late night music-led crowd. It was looking dark and tired and even the TV picture was poor. How did Simon Cowell get to be so famous? It's Raining Men. Or Cats And Dogs.